Your contribution to Paws and Think provides life-changing programs to people in need! Our donors are ensuring we can evaluate & register even more therapy animal teams and help at-risk youth learn life skills while finding shelter dogs their forever homes. Paws & Think, Inc., is a 501(c)(3) charitable organization, so your contribution is tax-deductible. Thank you for your gift! You may donate online or by personal check. Click on the button below to make a donation. By clicking on the button below, you will be redirected to the PayPal website where you can make a donation using your credit card. If you have any questions, feel free to contact us. Have a PayPal account? If you have a PayPal account, we encourage you to donate using this link. It is our PayPal Giving Fund in which all transaction fees are paid by PayPal, rather than our organization. You must have a PayPal account if you would like to make a donation this way. Note: If you are making a donation in honor of or in memory of a person or pet, please include the name to be recognized in the section labeled “Add special instructions to the seller.” This section appears on the last page before confirming your donation. If you have any issues with finding that section, simply send a message to kburton@nullpawsandthink.org with your name, donation amount and whose memory it is honoring. Thank you. Many corporations match the dollars that their employees contribute, stretching your dollars. Need more information for your employer? Please contact us. We’re glad to provide this information. Shop til you drop, and help Paws and Think earn cash! 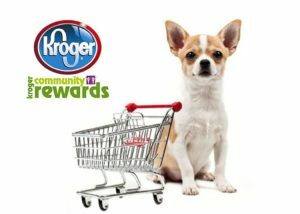 Paws and Think is now a Kroger Community Rewards Partner. By participating in the Community Rewards program, you can help raise funds for Paws and Think to continue our work in the local community. 1. Go to KrogerCommunityRewards.com and register with your Kroger Card. 2. When asked which nonprofit you would like to support, enter “Paws and Think” or our organization number: 35397. 3. Shop at Kroger and watch your points add up. Visit GiveBackAmerica.org to shop at a wide variety of retail partners like Apple, Barnes & Noble, Amazon and Target.com. Each time you shop at a partner through this link, Paws & Think will receive a commission which we’ll use to help fund our operations. When you shop on AmazonSmile, the AmazonSmile Foundation will donate 0.5% of the price of eligible purchases to Paws and Think. All you need to do is choose Paws and Think as your charity of choice. United Way contributions can be earmarked for organizations that represent your interests. Please consider designating Paws & Think, Inc., on your pledge card. If you would like to donate your time or you have materials that may be helpful, please contact us!